316 pages | 41 B/W Illus. This book takes a holistic approach to the prevention and control of infectious diseases from enteric pathogens, covering different concepts and approaches to address these challenging diseases, with special emphasis on HIV and AIDS. It examines several different approaches, such as ayurvedic, bioinformatic, and fungal- and metal-based treatment of diseases in the first section. The remaining chapters fully focus on various approaches specifically to HIV and AIDS, one of the most challenging infectious disease known to mankind. The book also discusses recent trends in HIV and AIDS research, ongoing treatments, case studies, and major achievements. 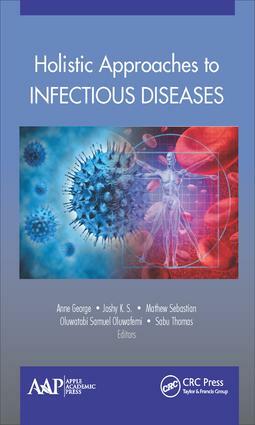 This book, featuring the unique methods and condition of India, introduces and estimates different approaches to the prevention, control, and treatment of infectious diseases. Major efforts are devoted to the holistic approach to AIDS, the deadly disease of human immune system, and HIV, the pathogen that causes AIDS. The book includes studies on the establishment of mathematical models on the transmission dynamic, the connection between mental and physical health in HIV-positive people, advanced understanding and therapeutic approaches for several specific conditions, as well as government efforts and achievements, all presented in a highly luminous and readable manner. Additionally, it brings new lines of thinking into this field by providing a refreshing view over alternative and complementary medicine practice aside from an insight into the treatment of nanoparticles combined with metal. Each chapter is thick with leading-edge and in-depth knowledge, producing precious experience for reference and further study while being especially valuable for scholars from developing countries because of its close attention to cases in India." Preface. The Ayurvedic Treatment of Neurodegenerative Diseases. Alternative and Complementary Medicine in Treating Fungal Dermatophytic Infections. In Vivo Suppression of Solid Ehrlich Cancer via Ag and Co/Ag Mediated PTT. Integrating Bioinformatics in Alternative Medicine Practice: An Insight. Recent Advances in HIV/AIDS. Analysis of a Simple HIV/TB Coinfection Model with the Effect of Screening. Status and Trends of HIV Among High Risk Groups and Antenatal Women in India: Estimates from Sentinel Surveillance and NFHS-3. Care and Support to People Living with HIV/AIDS (PLHIV) Through Community Care Centre (CCC) Approach in India. Opportunistic Infections in HIV/AIDS: An Overview. Relationship Between Psycho-Spiritual Well-Being and Physical-Illness Behavior in HIV Seropositive Individuals. Advances in the Understanding and Treatment of Children with Cancer and HIV Infection. Comparative Pharmacokinetics for Optimizing ART. Index. K. S. Joshy is a researcher working at the International and Inter University Centre for Nanoscience and Nanotechnology and C.M.S. College, Mahatma Gandhi University, Kottayam, Kerala, India. She has received a bachelor’s degree in chemistry from Kerala University, Kerala, India; a master’s degree in polymer chemistry from the School of Chemical Sciences Mahatma Gandhi University, Kottayam, Kerala, India; and MPhil degree in polymer chemistry from Cochin University of Science and Technology, Kochi, Kerala, India. Joshy carried out her PhD work at Mahatma Gandhi University, Kottayam, Kerala, India. She is currently pursuing her research on the development of lipid and polymer nanoparticles for drug delivery applications. She has publications in international journals and conference proceedings in her credit. Anne George, MD, is an Associate Professor at the Government Medical College, Kottayam, Kerala, India. She did her MBBS Bachelor of Medicine and her Bachelor of Surgery at Trivandrum Medical College, University of Kerala, India. She acquired a DGO (Diploma in Obstetrics and Gynaecology) from the University of Vienna, Austria; a Diploma of Acupuncture from the University of Vienna; and her MD from Kottayam Medical College, Mahatma Gandhi University, Kerala, India. She has organized several international conferences, is a fellow of the American Medical Society, and is a member of many international organizations. She has five publications to her name and has presented 25 papers. Mathew Sebastian, MD, has a degree in surgery (1976) with a specialization in Ayurveda. He holds several diplomas in acupuncture, neural therapy (pain therapy), manual therapy, and vascular diseases. He was a missionary doctor in Mugana Hospital, Bukoba in Tansania, Africa (1976–1978) and underwent surgical training in different hospitals in Austria, Germany, and India for more than 10 years. Since 2000 he has been the doctor in charge of the Ayurveda and Vein Clinic in Klagenfurt, Austria. At present he is a Consultant Surgeon at Privatclinic Maria Hilf, Klagenfurt. He is a member of the scientific advisory committee of the European Academy for Ayurveda, Birstein, Germany, and TAM advisory committee (Traditional Asian Medicine, Sector Ayurveda) of the Austrian Ministry for Health, Vienna. He conducted an International Ayurveda Congress in Klagenfurt, Austria, in 2010. He has several publications to his name. Oluwatobi Samuel Oluwafemi, PhD, is a Senior Lecturer at the Department of Chemistry and Chemical Technology at Walter Sisulu University, Mthatha Campus, Eastern Cape, South Africa. He has published many papers in internationally reviewed journals and has presented at several professional meetings. He is a fellow of many professional bodies and a reviewer for many international journals, and he has received many awards for his excellent work in material research. His current research interests include application of nanoparticles in medicine, water treatment, polymer, LEDs, and sensors. Dr. Sabu Thomas is a Professor at the School of Chemical Sciences and Honorary Director of the International and Inter University Centre for Nanoscience and Nanotechnology, Mahatma Gandhi University, Kottayam, Kerala, India. He joined Mahatma Gandhi University as a full-time faculty in 1987. He has been associated with several universities in Europe, China, Malaysia, and South Africa. Professor Thomas is a member of the Royal Society of Chemistry of London, a member of the New York Academy of Science, USA, and the recipient of awards from the Chemical Research Society of India and the Material Research Society of India (2013). Professor Thomas has supervised 65 PhD theses, and he has more than 530 publications, 43 books, four patents, and 18163 citations to his credit. The h-index of Prof. Thomas is 68, and he is listed as the 5th position in the list of Most Productive Researchers in India in 2008. His research focuses on polymer blends, recyclability, reuse of waste plastics and rubbers, fiber-filled polymer blends, nanocomposites, elastomers, pervaporation phenomena, and sorption and diffusion.